Scientists synthesized porous hollow carbon spheres (HCS, shown in pink), incorporated them in a triblock copolymer (PS-PEB-PS, two blocks of polystyrene flanking a block of poly[ethylene-ran-butylene]) matrix and spin cast the mixture to create a robust membrane with improved permeability and selectivity for smaller carbon dioxide molecules (red and white) compared to larger nitrogen molecules (blue). March 2, 2017 – Oak Ridge National Laboratory chemists report in the journal Advanced Materials that they have accelerated membrane-based gas separation with porous hollow nanospheres that could ultimately separate carbon dioxide from flue gases at power plants. 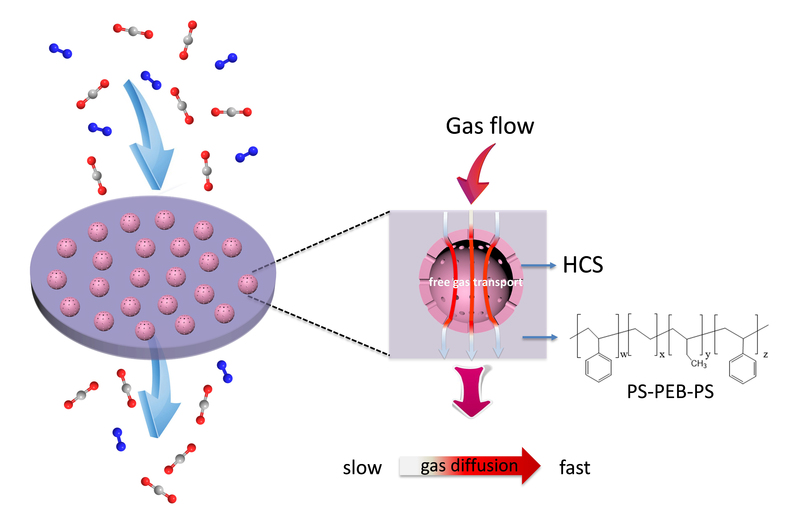 The scientists created a polymer membrane containing hollow spheres with a porous shell that provide free space through which gas diffuses quickly. “It’s the first time hollow carbon spheres have been incorporated into polymers,” said ORNL’s Jinshui Zhang. “We saw increases of 40 percent in selectivity and 800 percent in permeability [for smaller carbon dioxide molecules compared to larger nitrogen molecules].” The spheres are 80 times narrower than a human hair; the pores penetrating them are 500 times smaller still. Next, the researchers will change the sphere size, shell thickness and membrane polymer to optimize performance.